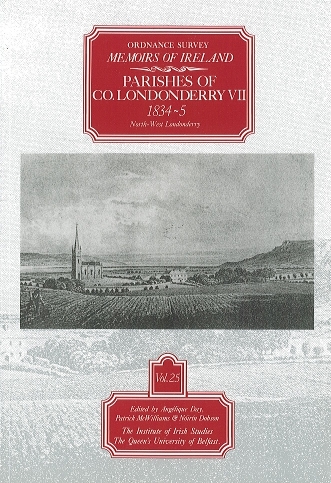 Ordnance Survey Memoirs of Ireland, Vol 25: County Londonderry VII. This volume contains the Memoirs for the parishes of Bovevagh and Tamlaght Finlagan in the north-west of the county. It covers an area immediately west of the River Roe and stretching to the shores of Lough Foyle, as well as the important town of Ballykelly and fertile district of Myroe. We learn of the economy and society of this strongly agricultural region dotted with mills and gentlemen's seats. The influence of the Fishmongers' Company is evident in the public buildings of Ballykelly and proposed navigational improvements in the rich fishing area of the Roe. The antiquities and traditions of the area are exceptionally well documented, and social life is recorded through habits of the people and emigration lists. Together these Memoirs provide a unique insight into life in this area over one hundred and fifty years ago.